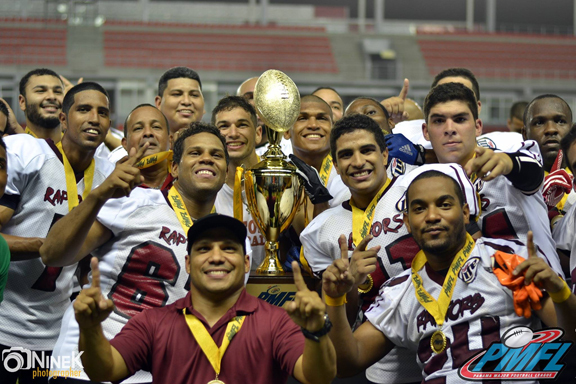 The semi-final playoffs that preceded the PMFL 2015 Championship on Sunday, June 14th and saw the 4th place USMA FRAILES nudge out the favored back-to-back champs PANAMA SAINTS by 12-07 during a torrential rainstorm. The other finalists RAPTORS F.C. won against the COLON EAGLES 20-13 to secure their place. The game was aired live on the Panama channel COS/2 and streamed pay on demand. 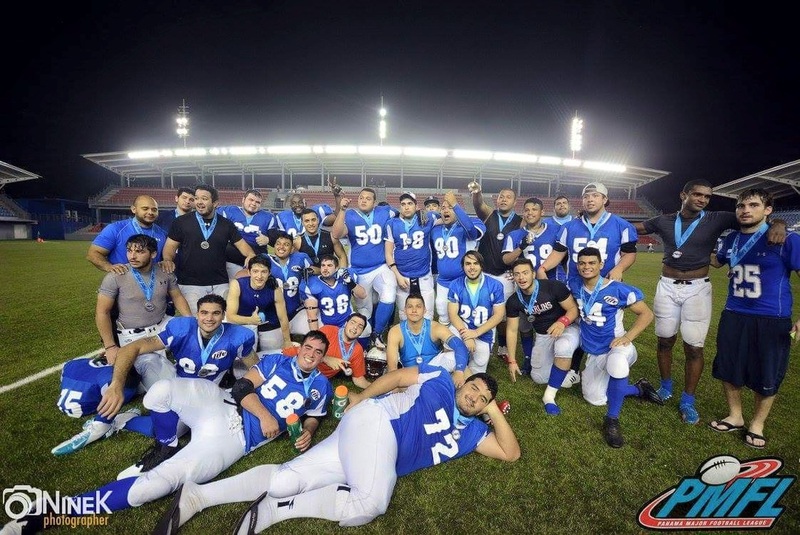 PMFL 2015 CHAMPIONSHIP (Copa Miller Lite) was played at the Maracana Stadium in Panama City, Panama on Saturday, June 20th in front of an enthusiastic fan zone. Touchdown action occurred for the RAPTORS F.C. early on in the opening minutes of the 1st quarter when QB, Justin McKenzie made a 54 yard pass and catch to WR, Jairo ‘Janks’ Quintero. The second score during the same quarter was a fumble return by CB, Alfredo Camarena for 60 yards resulting in a 13-0 lead for the RAPTORS F.C. In the 2nd quarter RAPTORS F.C. RB, Kendrick Belgrave had a 70 yard touchdown run to put the RAPTORS F.C. up 20-0 at halftime. 3rd quarter saw no score action. 4th quarter RAPTORS F.C. QB, Justin McKenzie scored a 1 yard touchdown run to boost the score 27-0. The USMA FRAILES finally secured touchdown action when Alejandro Watson passed to Dominik Fiedrichks and a 2 point conversion to Adrian Flores to make it 27-8 RAPTORS F.C. After an onside kick the USMA FRAILES scored to make it 27-14 on a 1 yard touchdown run by Alejandro Watson. RAPTORS F.C. DL/OL, Asaf Walker scored on a fumbled punt less then 2 minutes left in the game for 6 points. RAPTORS F.C. stomped out the USMA FRAILES with a 33-14 win. PMFL 2015 Championship MVP: RB Kendrick Belgrave, RAPTORS F.C. Defensive MVP: CB Alfredo Camarena, RAPTORS F.C. Offensive MVP: RB Kendrick Belgrave, RAPTORS F.C. PMFL 2015 game season MVP awards ceremony will be held on Thursday, June 25th. 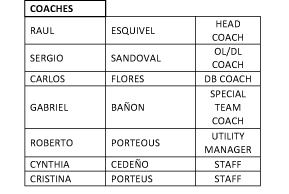 Ivan ‘Moto’ Paz was the founding president of the Panama Major Football League (PMFL) in 2011 and has continued to oversee its development. 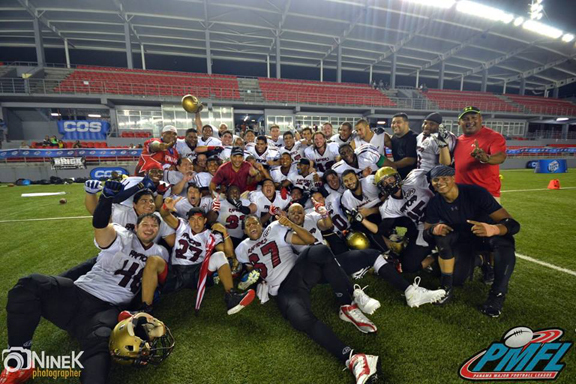 Fact: Panama Saints won the Panama Major Football League (PMFL) in 2013 & 2014 (before 2011 the PMFL was known as the contact open league 18+). The Panama Saints have won 12 championships over the years.